Meleagant (or Melyag(r)aunce or Melwas) is best known as the wicked knight who abducts Guinevere and is ultimately slain by Lancelot. The earliest form of the name, Melwas, has been interpreted as meaning "prince of death" or "princely youth." The classic account of the abduction story is in Chrétien de Troyes's Lancelot or the Knight of the Cart, in which Lancelot, because of his great love for Guinevere, suffers the ignominy of riding in a cart, a form of transportation reserved for criminals so that he can continue his quest to free her. The story is, however, told by others both before and after Chrétien. It can be found in The Life of St. Gildas(c. 1130) by Caradoc of Llancarfan, who says that Melwas, ruler in the summer region ("in aestiva regione"), is attacked by Arthur because he carried off Guinevere. In this version, peace is restored with the help of Gildas. A Welsh poem, formerly thought to be a dialogue between Arthur and Guinevere is now titled the "Dialogue of Melwas and Gwenhwyfar." 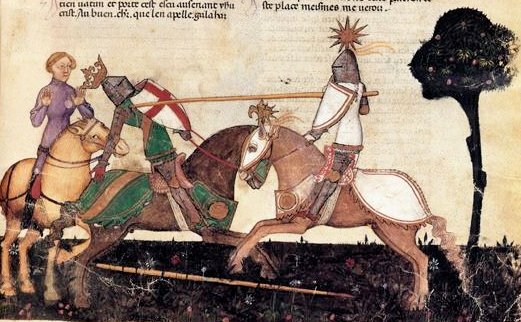 In addition to Chrétien's version, the story is found in French medieval literature in the Vulgate Lancelot, which is the source for Malory's "Knight of the Cart" episode.